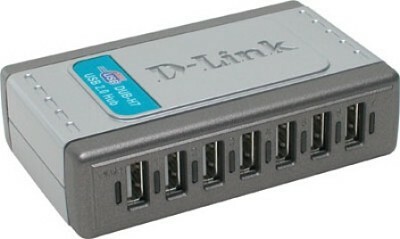 The D-Link DUB-H7 7-Port USB 2.0 Hub provides an easy way to add 7 additional USB ports to your PC or Mac; allowing you to connect more devices. With its Fast Charge Mode; each of the USB ports can provide sufficient power to connect and charge iPads and tablets. With the DUB-H7 7-Port USB 2.0 Hub; you can conveniently add 7 additional USB 2.0 ports to a notebook or desktop computer; allowing you to connect 7 more USB devices; such as digital cameras; printers; external hard drives; keyboard/mouse; flash drives and tablets. USB 2.0 technology supports fast data transfer rates of up to 480 Mbps; which means that you can save/access files and sync your devices faster compared to previous USB standards. The DUB-H7 features 7 Fast Charge USB ports that are designed to provide increased maximum charging current of up to 2.4 A1. This makes it perfect for charging power-hungry devices like the iPad or tablets quickly; even with their high-capacity batteries. The DUB-H7 does not require to be connect to a computer to charge your devices. With it's compact size; so you can take it with you on your travels to charge your smartphone; tablet and camera without the need to bring multiple chargers. Alternatively; you can use the DUB-H7 without the power adapter to easily add 7 additional USB port to any computer. Simply connect the DUB-H7 to your notebook or desktop computer to add 7 additional USB ports. It's that easy; no drivers or software installation required.